Unfortunately there is no lid for this. 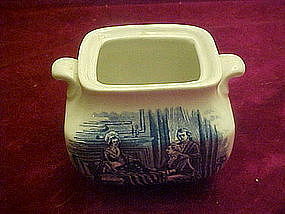 Sugar bowl in the historical colonial scenes, Liberty Blue, Staffordshire England. Bowl is in perfect condition and has a scene with Betsy Ross and the flag.